In a recent issue of Breast Cancer Research, Guo and colleagues provided mechanistic evidence supporting the role for microRNA (miR)-510 as a novel oncomir playing a pivotal role in human breast cancer via regulation of expression of peroxiredoxin 1 . Their study follows the original observation of elevated miR-510 expression in human breast tumor samples described by Findlay and colleagues in 2008 . To acquire a deeper insight into the potential role of miR-510 in human breast cancer, we carried out an in silico analysis of the miR-510 abundance in clinical breast cancer samples using three independent publically available datasets (described in Additional file 1). Conspicuously, we have found that expression of miR-510 was virtually nonexistent in clinical sample sets (Dataset 1  and Dataset 2 ). Only seven out of 473 clinical breast cancer specimens altogether demonstrated the miR-510 miRNA-Seq reads (Figure 1A,B, left), all of which could be attributed to a very low spectrum of the whole expression range of all miRNAs expressed in the respective datasets (Figure 1A,B, right). Analysis of the same kind carried out in 11 normal tissue samples (included in Dataset 2 ) revealed one sample expressing a low level of the miR-510 gene (Figure 1C). Similarly, one out of six breast cancer cell lines (included in Dataset 2) showed detectable expression of miR-510 (Figure 1D). Overview of miR-510 expression in clinical breast cancer samples, normal breast tissues and six breast cancer cell lines using miRNA-Seq experimental results from two independent studies. MicroRNA (miR)-510 expression from (A) Cancer Genome Atlas Network (Dataset 1 ) and (B-D) Farazi and colleagues (Dataset 2 ). Right: expression levels recorded for the miR-510-positive cases (red bars) in the context of the entire expression distribution of miRNA in the respective parts of the datasets. Analysis of an independent dataset (Dataset 3 ) showed expression of miR-510 in a substantial number of cases studied. One should, however, consider that, similar to the previously mentioned miRNA-Seq experiments, the expression of miR-510 in Dataset 3 could be attributed to the very low spectrum of the expression range (Figure 2A), and consider that microarray results are by their nature characterized by a very modest signal-to-noise separation, resulting in a low estimation confidence for the low readouts. Nevertheless, we did attempt to assess whether stratification of Dataset 3 by the median expression signal of miR-510 would correlate with the disease-free survival time (Figure 2B). 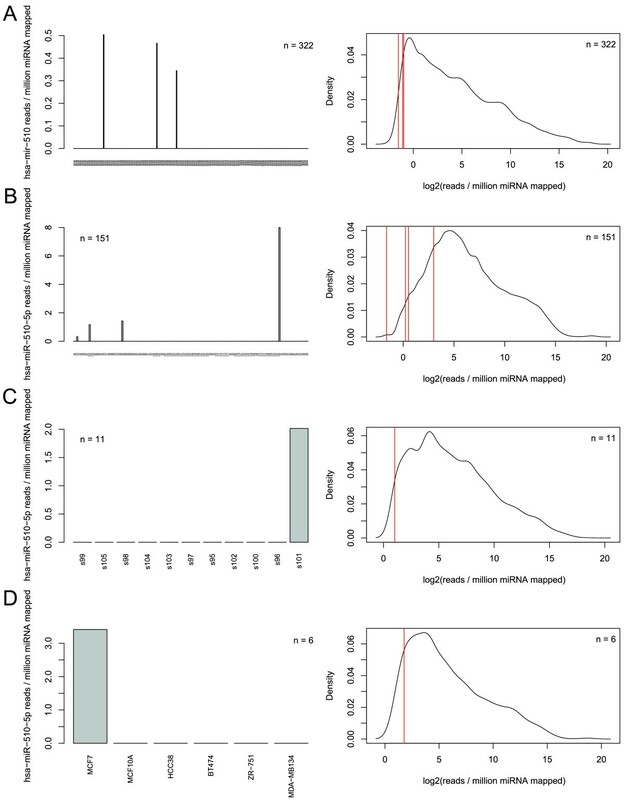 Results of the analysis revealed that, although the higher strata of miR-510 expression showed a tendency to correlate with slightly worse disease-free survival times (Figure 2B), the correlation did not reach statistical significance (P = 1.88 × 10−1). miR-510 expression signal derived from Agilent 4 × 44 K microarray dataset by Enerly and colleagues (Dataset 3 ). (A) MicroRNA (miR)-510 expression (red bars) presented against the expression signal distribution of the whole dataset. (B) Cox proportional hazard model of survival analysis of the groups stratified by the median value of the miR-510 expression signal. Note: two miR-510-positive cases did not have accompanying survival data assigned, hence the difference in number of cases shown in (A) and (B). Considering our observations and acknowledging the high clarity of mechanistic observations by Guo and colleagues , we assume that miR-510 ought to be further evaluated in human cancer types other than breast cancer, especially those in which peroxiredoxin 1 seems to play a role. This work was supported by a grant from the European Commission 7th Framework Programme: FP7-REGPOT-2012-CT2012-316254-BASTION. The authors wish to express their gratitude to Prof. Jakub Golab and Prof. Krystian Jazdzewski of Medical University of Warsaw for their consultation and resourceful comments.